Tell them to Stand with Planned Parenthood! Is your legislator doing a great job? A lousy job? Let them know! At Planned Parenthood, we don’t believe your health care should depend on who you are, where you live, how much money you make, or on your race or immigration status. We will never stop fighting for our patients. 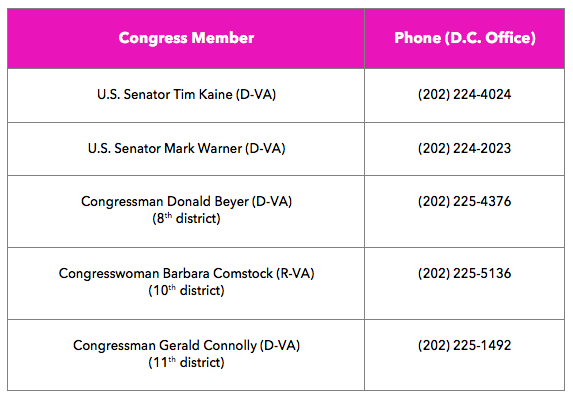 Call your representatives on Capitol Hill now and demand that they oppose any effort to defund Planned Parenthood! Who is your congressional representatives? Find out here! Not sure what to say? Here's a helpful script. Hi, my name is _____ and I am live in _______ and my zipcode is______. I am calling to tell [name of representative] to stand with Planned Parenthood. Thousands of women, men and young people -- come through the doors of Planned Parenthood health centers every year for often lifesaving care like cancer screenings, birth control, and STI and STD tests. These patients cannot afford to have their basic reproductive health care taken away. Defunding Planned Parenthood has people across the country worried about losing access to their provider, losing their birth control, and losing access to the high quality affordable services that they rely on. The majority of your constituents in _____ stand with Planned Parenthood and the idea of defunding Planned Parenthood is very unpopular with voters, including myself. I urge [name of senator or representative] to oppose any defunding efforts. Thank you. Have a nice day! The idea that other providers could absorb Planned Parenthood’s patients has been resoundingly dismissed by experts. In fact, Georges Benjamin, the executive director of the American Public Health Association, called the idea “ludicrous." In 21% of counties where Planned Parenthood operates, they are the only safety-net family planning provider. In 68% of counties where Planned Parenthood operates, they serve at least half of all safety-net family planning patients. More than 1/2 of Planned Parenthood health centers are in rural or underserved patient communities.